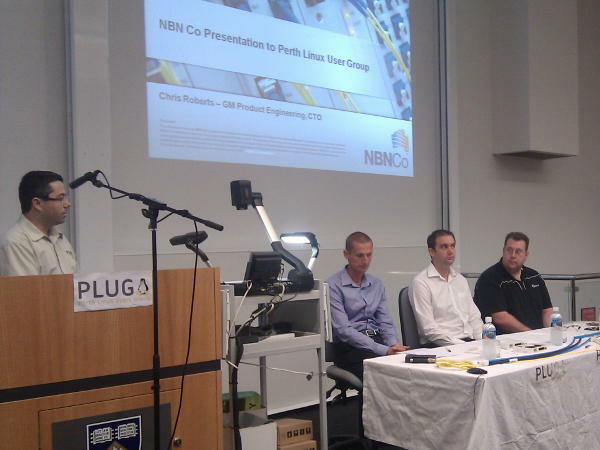 Earlier in the week, I attended a PLUG discussion panel about the National Broadband Network. While I had been following some of the high level information about the project, it was interesting to hear some of the more technical information. The evening started with a presentation by Chris Roberts from NBN Co, and was followed by a panel discussion with Gavin Tweedie from iiNet and Warrick Mitchel from AARNet. One question I had was when they’ll get round to building out the network where I live. There is a rollout map on the NBN Co site, but it currently only shows plans for works that will commence within a year. Apparently they plan to release details on the three year plan by the end of this month, so hopefully my suburb will appear in that list. The NBN is being built on top of three methods of connection: GPON fibre for built up areas, fixed LTE wireless (non roaming) for the smaller towns where it is not economical to provide fibre, and satellite broadband for the really remote areas. All three connection methods provide a common interface to service providers, so companies that provide services over the network are not required to treat the three methods differently. The wireless and satellite connections will initially run at 12Mb/s down and 1Mb/s up, while fibre connections can range from 25/5 to 100/40 (with the higher connection speeds incurring higher wholesale prices). It should be quite an improvement over the upload speed I’m currently getting on ADSL2. Chris brought in some sample “User Network Interface” (UNI) boxes that would be used on premises with a fibre connection. It provided 4 gigabit Ethernet ports, and 2 telephony ports. Rather than the 4 Ethernet ports being part of a single network as you’d expect for similar looking routers, each port represents a separate service. So the single box can support connections to 4 retail ISPs, or for any other services delivered over the network (e.g. a cable TV service). You would still need a router to provide firewall, NAT and wifi services, but since it only requires Ethernet for the WAN port there should be a bit more choice in routers than if you limit yourself to ones with ADSL modems built in. 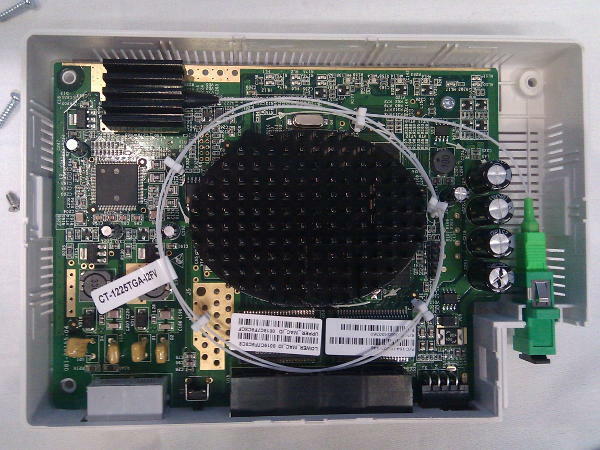 In particular, it should be easier to find a router capable of running an open firmware like OpenWRT or CeroWRT. The box also acts as a SIP ATA, where each of the two telephony ports can be configured to talk to the servers of different service providers. It is also possible for NBN Co to remotely monitor the UNI boxes in people’s houses, so they can tell when they drop off the network. This means that they have the ability to detect and respond to faults without relying on customer complaint calls like we do for the current Telstra copper network. Since the NBN is supposed to provide a service equivalent to the current copper telephone network, the UNI box is paired with a battery pack to keep the telephony ports active during black outs, similar to how a wired telephone draws power from the exchange. This battery pack is somewhat larger than the UNI box, holding a 7.2 Ah lead acid battery. At 10W, this can keep the box running for around 8 hours. The battery pack will automatically cut power before it is completely drained, but has an emergency switch to deliver the remaining energy at the expense of ruining the battery. If you’re in Perth, why not come down to the next PLUG event on March 26th? It is an open source themed pub quiz at the Moon & Sixpence. Last year’s quiz was a lot of fun, and I expect this one will be the same. This week I put out a new release of pygpgme: a Python extension that lets you perform various tasks with OpenPGP keys via the GPGME library. The new release is available from both Launchpad and PyPI. There aren’t any major new extensions to the API, but this is the first release to support Python 3 (Python 2.x is still supported though). The main hurdle was ensuring that the module correctly handled text vs. binary data. The split I ended up on was to treat most things as text (including textual representations of binary data such as key IDs and fingerprints), and treat the data being passed into or returned from the encryption, decryption, signing and verification commands as binary data. I haven’t done a huge amount with the Python 3 version of the module yet, so I’d appreciate bug reports if you find issues. So now you’ve got one less reason not to try Python 3 if you were previously using pygpgme in your project.